It’s March, so of course there is NCAA “madness” and many options for bracket building. Yahoo Sports is back with the Tourney Pick’em marketing activation. 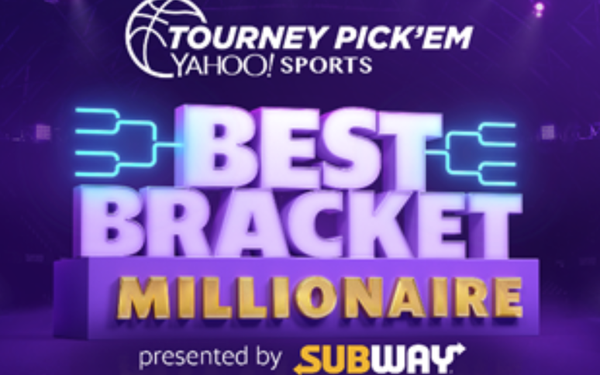 Celebrating 20 years of the game, this year Yahoo Sports is offering hoops fans a chance to win $1 million for the best bracket in its “Best Bracket Millionaire Contest,” presented by Subway. Players can create their groups and pick their brackets through March 21 in a multitude of ways, including a "Subway Selects" drop-down, autofill option. The best bracket prize will be won by the player who has accumulated the most points during the contest. A Subway marketing exec compares all the options for selecting winners in a bracket as similar to building a sandwich at the fast-food retailer. "At Subway, we know something about choices -- and while your bracket might bust, Subway has something for everyone," states Melissa Sutton, director of media, Subway. Other media brands offering bracket contests include CBS Sports, where billionaire Warren Buffett is offering Berkshire Hathaway employees $1 million a year for life for picking the perfect Sweet 16 field. He’s also once again offering $100,000 to the employee who achieves the most correct picks. DraftKings, ESPN and Fox Sports also have their own bracket contests. First-round games take place Thursday afternoon, and the tournament concludes on April 8 in Minneapolis.